Mummies and Masterpieces – Opening the door to the world of museums. Opening the door to the world of museums. 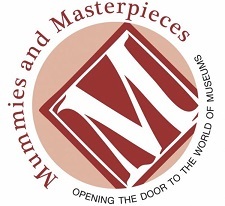 Mummies and Masterpieces has been creating museum programs for 24 years. Founded in NYC, we are currently based in Highland Park, Illinois with offices in Orlando, FL and Rockville, MD. Additional branches will be opening this year in Atlanta, GA and New Haven, CT. Our programs are available worldwide. Mummies and Masterpieces is aligned with national and state learning standards. We value the importance of experiential learning and enhance lessons through worldwide museum collections. Our programs consist of exciting and unique slide discussions, hands-on art workshops and/or museum visits. We service religious institutions, day cares, pre-schools, elementary schools, middle schools, high school, colleges, graduate schools, home schoolers, libraries, community centers, park districts, hospitals, nursing homes, and rehabilitation centers. Our programs take place at your educational institution, at a local museum, or both. They can be booked as a one-time experience or a series of workshops. Click here for an example of upcoming after school programs, which are making their debut this Fall in Orlando, Florida. Please enjoy exploring our site and learning about over 70 different kinds of programs that we offer for all ages. Exciting things are happening at Mummies and Masterpieces! THANK YOU TO OUR MANY CLIENTS WHO HAVE BOOKED PROGRAMS FOR THE UPCOMING SCHOOL YEAR! If you are considering utilizing Mummies and Masterpieces for 2018-19, please contact us soon to ensure preferred dates and times.